Last week was rather busy, so over the past couple of weeks I've only read a couple of books. Both were crime books and both were new series for me. The first of those was Cold Dark House by Christopher Fowler. I'm not going to review it properly, it was a good book, possibly a trifle overlong and too much theatre detail, but it was quirky and fun. I'm just not certain that it was all I expected it to be. I'll read the other two books I own in the series but not sure if I'll read further than that. 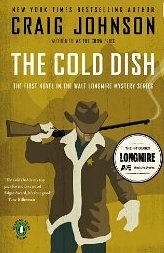 The better of the two by far was The Cold Dish by Craig Johnson. It took me several chapters to get into this one and I was probably about halfway through before I realised that I really was enjoying it. By the end, I loved it. Why? Well it was certainly a good mystery, so that helps. I had no idea who had done the deed until close to the end which is always fun. More than that though I found the characters got under my skin. Longmire himself is an excellent main character, flawed, very human, just doing his best in difficult circumstances. His relationship with Henry Standing Bear is wonderfully poignant, full of humour, their exchanges are sometimes hilarious. Henry himself is also a fantastic character, and there are several other Native Americans who are also interesting as well as Vic, Walt's female deputy. I love the way they all try to engineer a date for Walt and the awkward way Walt feels on the date after so many years out of the dating scene. Wonderful. The other big plus for me with this book was the setting. 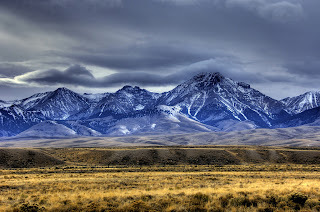 I had heard of The Bighorn Mountains in Wyoming of course but knew very little about them. From this book I got an excellent idea of how it is to live in the shadow of these iconic mountains, the beauty, the bleakness, the isolation, the weather. One long scene has Walt having to facilitate a rescue in a snow-storm in the mountains and I'm not exaggerating when I say it's one of the best scenes of that nature I've ever read. Fantastic... both in the description but also in the spiritual aspects the author injects into the story. I'm not always that keen on that kind of thing but the way in which it was handled here was skilful and it worked wonderfully for me. It's a long time since I've read a book that had more of a sense of place than this. To tell the truth I'm still thinking about this book and its characters and I'm having trouble starting something new. I have book 2 and have ordered 3 and 4 from Amazon but wanted to read something else before I carry on with the series. 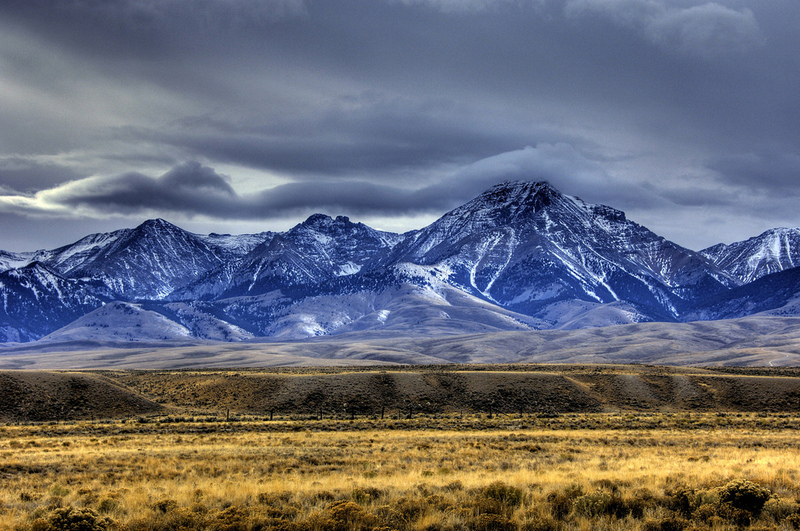 I shall be going back to Absaroka county very soon though. I read this book as part of my What's in a Name challenge which is being hosted by Beth Fish Reads. It covers the category of 'something you would find in your kitchen'. It also qualifies very well for my own USA challenge for the state of Wyoming. 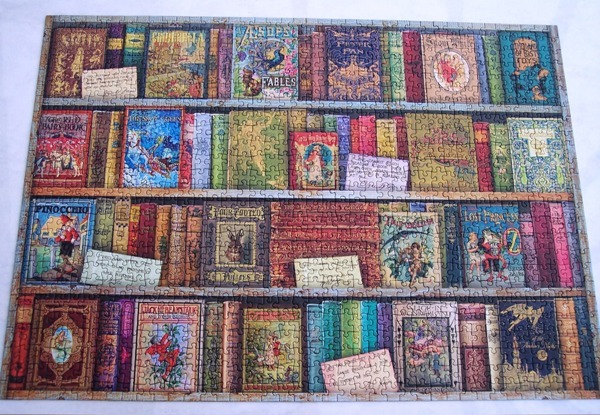 I know I have mentioned the fact that I do jigsaw puzzles here, and I know I've put the odd picture up with a book post. 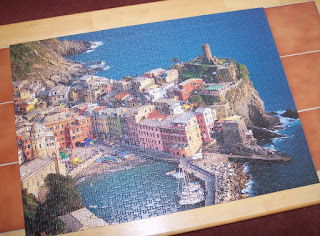 However, I don't think I've ever done a post dedicated entirely to jigsaw puzzles, if I have, I can't find it. So, inspired by several other jigsaw puzzle posts which I'll put at the end, I thought I would pop up a few pics of the four jigsaws I've done since Christmas. First up was Cobblestone Evening a painting by American artist, Thomas Kincade. 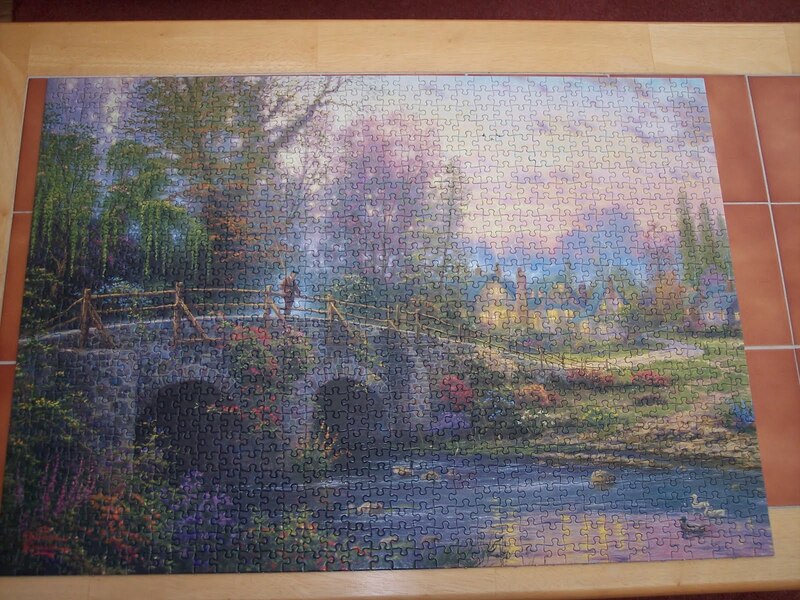 Paintings are by far my favourite kind of puzzle and this one was so nice to do with nice thick pieces which stayed where they were put. I've done several by this artist and will do more when I can find them. This one belongs to my eldest daughter. Next is Britain from the Air, a collection of famous British scenes which also belongs to my daughter. I thought this would be easy and then it wasn't. LOL. 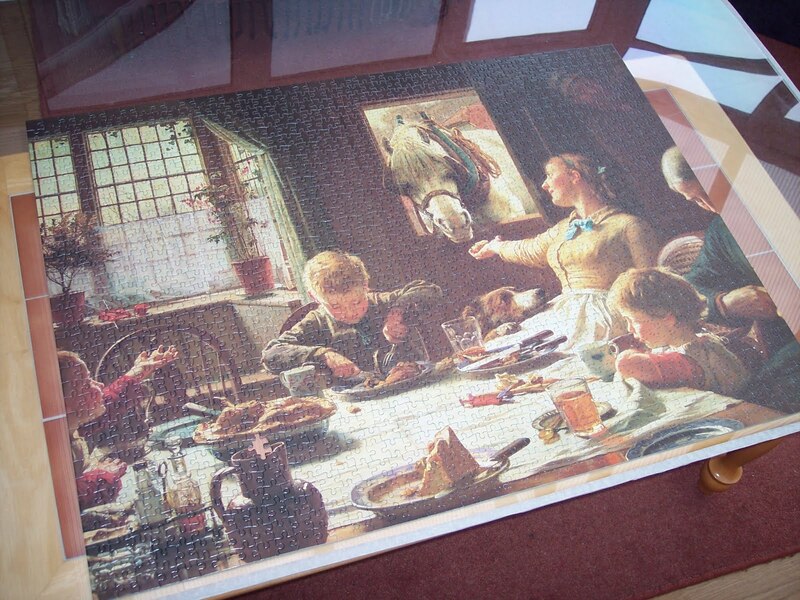 Last and most recent is a puzzle entitled, One of the Family. This is a painting by Victorian artist Frederick G. Cotman. 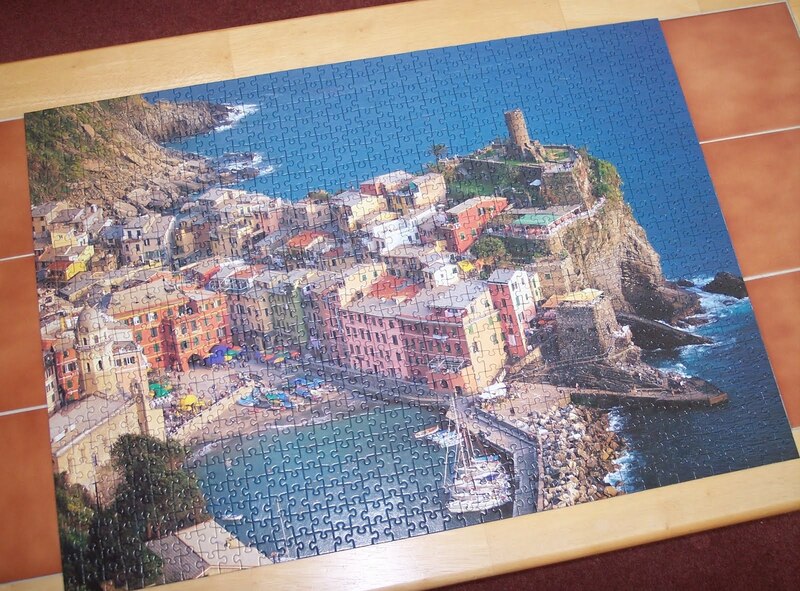 This one is slightly bigger than the others at 1,500 pieces (the rest are all 1,000) and was a bit tricky really. A lot of pieces looking the same, and all that brown was really hard and took me several days to do. 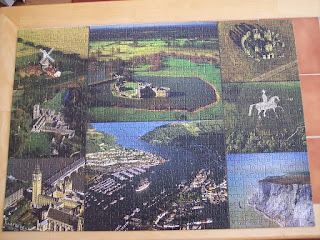 But I really enjoyed doing it, the only downside being, as the eagle-eyed will have noticed, there's a piece missing. 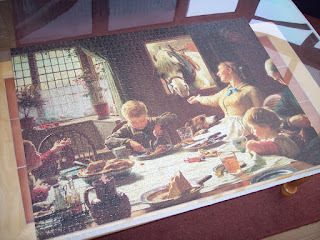 This is the penalty you pay for buying puzzles in charity shops. More often than not it's fine and they're complete, but just occasionally they're not and this is one of those instances. Oh well. So that's what I've been spending the cold and wet months of January and February doing, as well as devouring books of course. Peggy Ann at Peggy Ann's Post who has put up a virtual version of One of the Family for anyone to do. My first two books of February I haven't reviewed. This is because some months ago I decided not to try and review every single book I read, not because I haven't liked the books but really it's to do with time and a sore neck and shoulders when I spend hours typing away on the computer. So now I review books that have had a real impact on me and do 'mentions' of the others. So today I will 'mention' Fall of a Philanderer by Carola Dunn. It's book 14 in the author's 'Daisy Dalrymple' series and is set in a seaside village in Devon. I have to say, it's absolutely one of my favourites of the entire series, probably because of the setting but also her husband, Alec, a police inspector, is in it a lot and that suits me just fine. I'll also 'mention' A Book of Frank Herbert by, of course, Frank Herbert. Not sure why this book of science fiction short stories is so oddly titled, but there you go. As with all books of short stories, some I liked and some were a bit so-so. Frank Herbert was never one of my favourite science fiction authors, unlike my husband, Dune did nothing for me at all, had no idea what all the fuss was about to be honest. But such is life, it would be boring if we all liked the same thing. This was not a bad book and one or two stories were excellent, but it's now sitting in the charity shop box ready to be donated. So, an actual review and it's a book I saw mentioned on Pinterest of all places... I say 'of all places'... Pinterest is actually awash with bookish folk and libraries... wonderful. 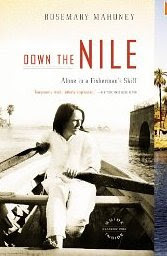 And the book is, Down the Nile: Alone in a Fisherman's Skiff by Rosemary Mahoney. Author, Rosemary Mahoney (I think she's written a clutch of non-fiction, mainly travel books) is an American who lives in the state of Maine. She's been rowing for about 10 years I gather and took it up because she lives on a small island and needed a way to get to the mainland. She does most of her rowing in Narragansett Bay - I love trying to get my tongue around these names, I presume it's a Native American word. I Googled it as I hadn't heard of it and it seems it's the bay that surrounds Rhode Island... it looks *so* beautiful. Anyway, the author develops a yearning to row a boat down The Nile from Aswan to the coast on The Med. This was after a normal trip to Egypt where she did the usual tourist thing with a tour boat and guides. She knows this is not going to be easy, not because it's physically difficult, she's sure it won't be, but because she'll be a woman in a country where women have no status whatsoever and no power. Buying the boat in Egypt was likely to be the hardest thing, as women never buy boats, and so it proved to be. Mahoney kicked her heals in Aswan for weeks, approaching boat owners and being laughed at and ridiculed. ... of which there are many, with a small crew, and see the sights that way. Luckily for her she eventually meets Amr, the only local captain of a felucca who has any sensitivity and understanding, a gentle man who treats her as an equal. She meets his family, mother and sister, and gradually gets to trust him enough to tell him what she wants to do. 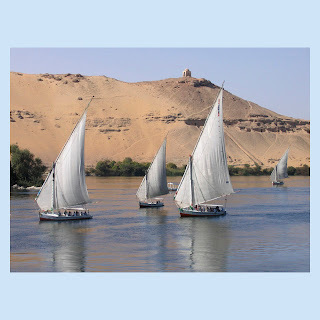 He suggests she find a boat and he will follow her in his felucca for part of the way, a female friend of the author, working in Cairo, also joins them and this is how Rosemary eventually sets out on her journey. Goodness, what an eye opener this book was for me. I'll be honest, Egypt is not a country I give an awful lot of thought to... bar its history which of course is quite fascinating. This book was written in 2009, just before The Arab Spring and Hosni Mubarak was still in power. I bet the author never imagined he would be gone within a couple of years. What had happened of course was that 62 members of a tour group had been hacked to death at Luxor in 1997 and tourism had never fully recovered. This lack of recovery, for me, was the shocking thing. I suppose I knew it, but unless you read a book like this, the effect it had on thousands of inhabitants of a very poor country never really hits home. Egypt relied entirely on tourists for income and that went with the massacre and now with more troubles in the country, presumably the situation is still dire. The actual rowing bit of the book is sort of secondary to the social side. Nevertheless it is interesting and there are descriptive passages which are stunning, I really 'got' Egypt and the feel of it from the book. I daresay I will never go there but at least now I have much more of an understanding of the country than I ever had before. Another side to the book was also excellent and that's the way the author used trips by famous people from Victorian times to illustrate how the country was then and is now. Shockingly, not a lot has changed! Principally she used writings from Florence Nightingale's Letters from Egypt: A Journey on the Nile and Gustave Flaubert's Flaubert in Egypt, a Sensibilty on Tour and compares their attitudes to what they found in the country. That was amusing. Flaubert was overly emotional and sensitve and loved prostitutes, Nightingale was a very down-to-earth Victorian woman who skipped up the pyramids ahead of her guides! Winston Churchill also apparently went down the Nile, his book My African Journey is available on Amazon. I'd love to read them all to be honest. This is a book that's so worth reading. It illustrates perfectly how you can be completely ignorant of the way a country is, read a book, and then *not* be quite so ignorant any more. I love how that can happen simply by picking up a book in the library. This will definitely be one of my non-fiction reads of the year. I simply loved it and am hoping to find more books by Rosemary Mahoney, a really terrific author. I tend to average six books a month so it looks like I had quite a good reading month in January. Especially as in years gone by I often found Janaury was a kind of slump month for me, reading-wise. No idea why that was but it doesn't seem to be the case this year as I read seven books last month. I'm not so interested in the number as I am the mix. Of the seven books, four were fiction and three non-fiction and I'm quite happy with that, delighted in fact as one of my reading 'hopes' for this year was to read a lot more non-fiction. 1. Rifling Through My Drawers by Clarissa Dickson Wright - essays of her comings and goings through a typical year. Very enjoyable. 2. High Rising by Angela Thirkell. From my review you can see how much I enjoyed this one and I plan to read more. 3. I Know Why the Caged Bird Sings by Maya Angelou. Brilliant. 4. Serving Victoria by Kate Hubbard. Superb. 5. Rendezvous With Rama by Arthur C. Clarke. Reminded me why I love classic science fiction as much as I do and made me look into a few more space opera type books, with help from that skilled enabler, Geranium Cat. I now have a whole bunch of them including, Consider Phlebus by Ian. 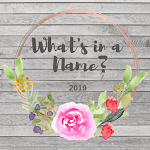 M. Banks, Helliconia Spring by Brian Aldis, The Mote in God's Eye by Larry Niven and Jerry Pournelle and Hyperion by Dan Simmons (library book). So I can forsee a good science fiction year this year. 6. & 7. Tempest Rising and Tracking the Tempest by Nicole Peeler. A few brief words about these two. These books feature Jane True who lives a pretty ordinary life in small town in Maine, working in a bookshop and looking after her father who has a heart condition. Two things make Jane stand out. Her mother mysteriously disappeared when Jane was six, almost as mysteriously as she appeared in the town after a violent storm. And Jane knows herself to be slightly odd anyway, as she has an addiction to the ocean and swimming in it - often dangerous swimming involving a local whirlpool. In fact she feels she may have been partly responsible for the drowning of her first boyfriend. Jane's life changes forever when a body is found on the beach where she swims, and murder is suspected. One night, Jane is chased on the way to her cove by a huge dog and there she is approached by a tiny woman, Nell, a gnome, and told she is a halfling, half human, half selkie. The dog is Anyan a shape shifter. She's told that the dead man, who jane knew from the bookshop was also a halfling and that her life could also be in danger. Someone would come to investigate. That *someone* turns out to be a vampire, Ryu, and Jane finds herself falling for him. Ryu introduces Jane to a hidden world of supernatural beings of all descriptions that exists in secret and that humans have never known about. But someone is out to add Jane to their list of murdered halflings and Ryu has his work cut out keeping Jane safe. In the second book Jane is back in Rockabill and Ryu in Boston and the two are trying to conduct a long-distance relationship. On Valentine's Day he sends her airline tickets to visit her for the weekend and she goes, anticipating a wonderfully romantic weekend. What she gets is murder and mayhem. A fire-demon halfling, Conleth, is on the loose and taking revenge for a lifetime of captivity it seems. Jane believes there may be a connection between where he was kept and some supernatural beings she ran foul of at the King and Queen's court; one, Jarl, had in fact tried to kill her, unbeknownst to Ryu. So he is hard to convince. Until it's discovered that Conleth has developed an unhealthy obsession with Jane and is probaly coming after her... but with what end in mind? I do quite enjoy having a kind of 'nonsense' series on the go that is light and fun and completely daft. These books have a lot of humour in them, an element of crime, and quite a lot of the supernatural. 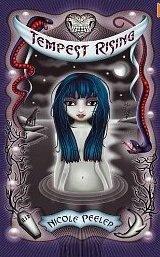 I enjoyed hearing about the various supernatural beings, and Jane is a fun heroine. I like her determination to remain independent and in the second book she underlines this quite strongly; things don't quite turn out as you'd imagine, romance-wise. These are not children's book's or even YA... they're definitely for adults as there is a small degree of eroticism, nothing offensive, but something to bear in mind if that's not your bag. These will probably be my light reads of 2013 - along with my Daisy Dalrymple books by Carola Dunn, as I still have six of those left to read. There are six Jane True books altogether, although that sixth book is not out until May I believe. I'm currently reading a Daisy Dalrymple book - Fall of a Philanderer which I'm loving as it's set in a Devon seaside village. Also dipping into The Book of Frank Herbert which is a science fiction anthology by the author of Dune. This month I'd like to read a book of letters, something about Queen Victoria, some Wilkie Collins, and some more science fiction. We'll see how that pans out, I'll probably end up reading none of those!